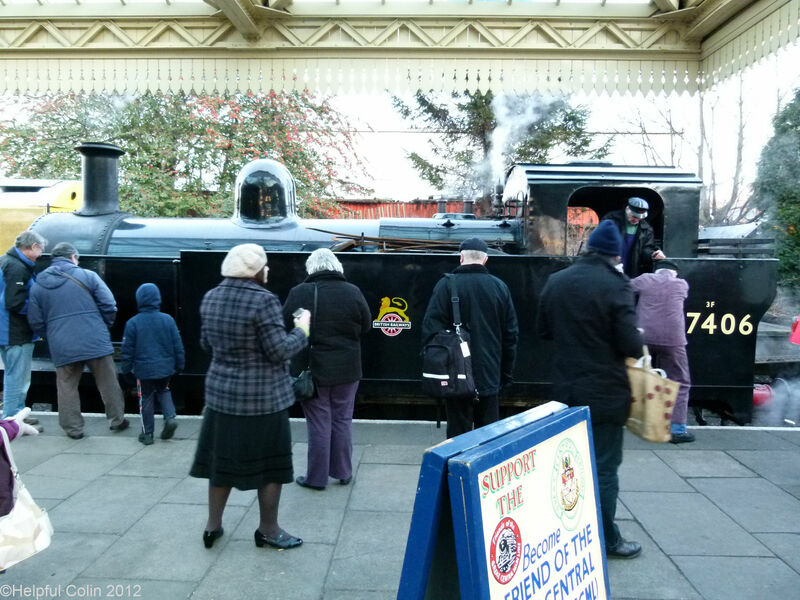 GCR Loughborough Central Platform Ticket (both sides) on a Winter Gala Day 2012. The GCR advertised 12 loco’s in steam and I saw 9. There was continual movement at the Great Central Station, Loughborough, and I did my best to capture it. I walked down to the shed at the north end of the station and found a few things to photograph and video on the way. It became very difficult to video the Royal Mail train leaving due to its delay and the hustle and bustle on the platform. I was only able to video it in the end by holding my camera above my head. Here is the Featured Image for those who can’t see it. Venus Transiting the Sun on 5th-6th June 2012 won’t happen again until 2117. Remember not to look directly at the sun and focus the sun onto a white card with a telescope/lens. Unfortunately for us in the UK this transit will be nearly over when we can see it which will be at dawn. People in America, Asia, the Middle East and the Arctic Circle will be able to see it during their evening or day time. Now on 6th June we are getting close to midsummer’s day so the sun will rise in the north east at 04:45 BST in London and at dawn there are usually a lot of buildings in the way of the sun. So you will need to be in flat country, on a hill, in a sky scraper or in a plane to see the sun at dawn. Also you won’t want any clouds in the way. Wikipedia – Venus transiting the sun prior to 2012. Since the event, Venus Transiting the Sun on 5th-6th June 2012, Many articles have been written and many photos were taken through telescopes all over the world as you can see from this Google search request. Wikipedia – Venus transiting the sun 2012. My wife’s wrist watch stopped working a few days ago. The problem was, of course, a flat battery. This led me to write about changing a watch battery using my wife’s watch as an example. I began by popping onto the Internet and ordering four, from JewelleryForAll on the Amazon Marketplace, @ 45p each with free p+p. They arrived on 14th Jan 2012. A little late I thought since they were ordered on 3rd Jan 2012, but never mind they were cheap enough. Wikipedia Protests! What exactly is it doing? Wikipedia protests against SOPA and PIPA by blacking out the English Wikipedia for 24 hours, beginning at midnight January 18, Eastern Time. Readers who come to English Wikipedia during the blackout will not be able to read the encyclopedia: instead, they will see messages intended to raise awareness about SOPA and PIPA, and encouraging them to share their views with their elected representatives, and via social media…..Learn more. How many times can you fold paper? How about 13? Have a look at this article about it in New Scientist. Author Helpful ColinPosted on 17 January 2012 29 July 2018 Categories Amusement, Human InterestsTags moon, New Scientist, paper folding, world recordLeave a comment on How many times can you fold paper? How about 13? My mentor drAnalog has advised me how to use Google Analytics to produce statistics of site visits. The analysis has thrown up some interesting results and from them I have concocted a Brain Teaser for your delight. Sorry no prizes given but you have the satisfaction of taking part. Some Derby people made 21 visits to this blog using an unspecified number of computers which we have to assume kept the same settings for each visit they made and hopefully used the same service providers each time. 13 visits were made using Internet Explorer, 6 using Google Chrome and 2 using Firefox browsers. 16 visits were made with Windows PC’s and 5 with Mackintosh computers. 18 visits were made via btcentralplus.com, 2 via ntl.com and 1 via virginmedia.com (service providers). 18 visits were made using 24bit colour and 3 using 32 bit colour systems. 8 visits used 1920×1200, 7 used 1366×768, 4 used 1280×800 and 2 used 1680×1050 screens. 19 visits use Flash version 11.1 r102 with Java support and 2 use Flash version 10.0 r32 without Java support. What was the minimum number of COMPUTERS needed to make the 21 visits to the blog? I suspect there might be enough data to deduce the answer but I can’t guarantee it. Answers posted in comments will be seen by others.